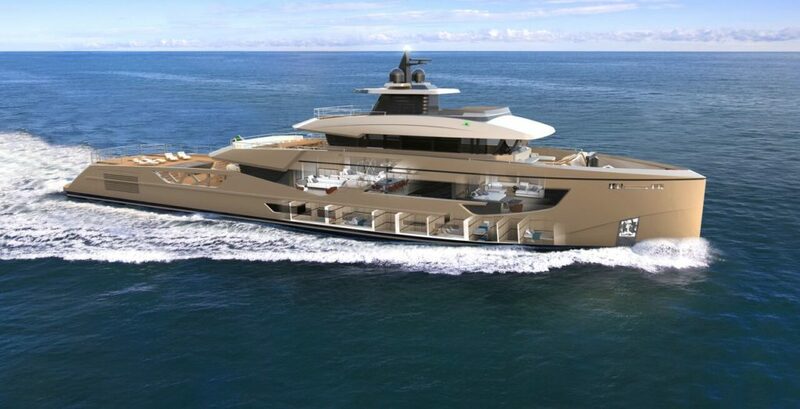 The will to combine the functionality typical of a Supply Vessel with the design features and quality finish of a superyacht is the underlying foundation of the concept behind this 52-metre Supply Vessel, developed by Rosetti Superyachts with the Italian designer Giovanni Griggio, of Phi Design Lab. After the first announcement last year during the MYS 2018, several enquiries were put forward and now the shipyard, which is specialised in the production of steel and aluminium yachts in the 35-140 metre range(Superyacht, Explorer, Supply Vessel and Support Vessel types), has decided to reveal more details about this specific yacht. 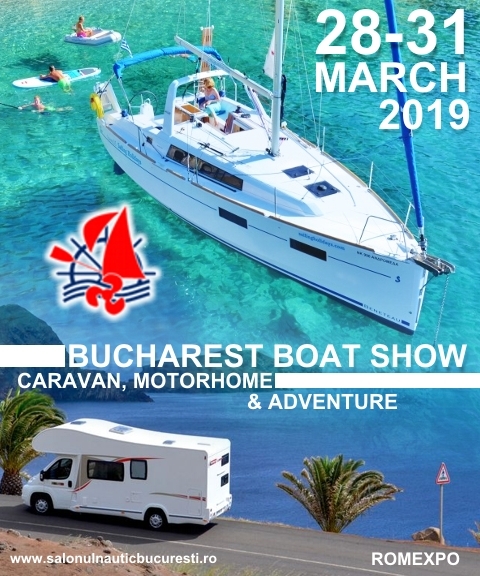 The shipyard was determined to offer owners a number of options, with a particularly flexible layout that allows to modify the configuration. A perfect example is the aft tender garage, which can be easily transformed into an 80m2 beach club. 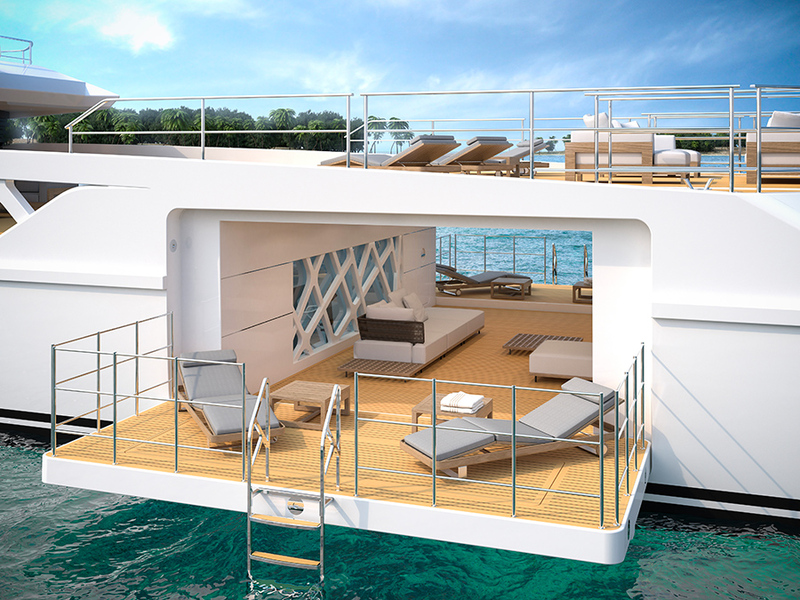 Opening the lounging decks on the topside creates a deep contact with the surrounding environment. Forward of this area are the gym and a spa, which include a sauna and Turkish bath, with natural light filtering through the transparent bottom of the swimming pool on the upper deck. the rest of the deck, ensuring the owners and guests are out of sight when the yacht is moored in a marina. 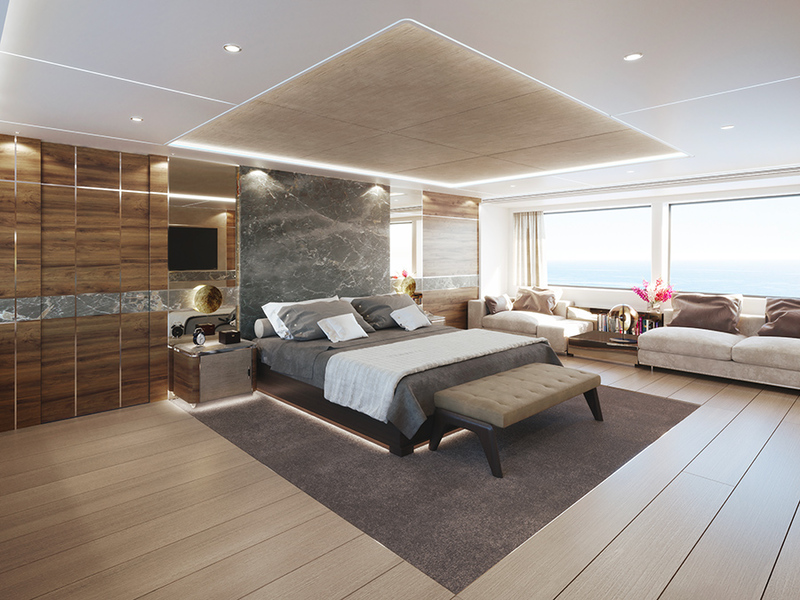 market has reacted well to this project, which has attracted considerable interest and that we strongly believe in,” claims Fulvio Dodich, Partner & CEO of Rosetti Superyachts. The deck and the main salon are developed on the same level and the possibility of opening the sliding doors completely allows to obtain a single, open space. 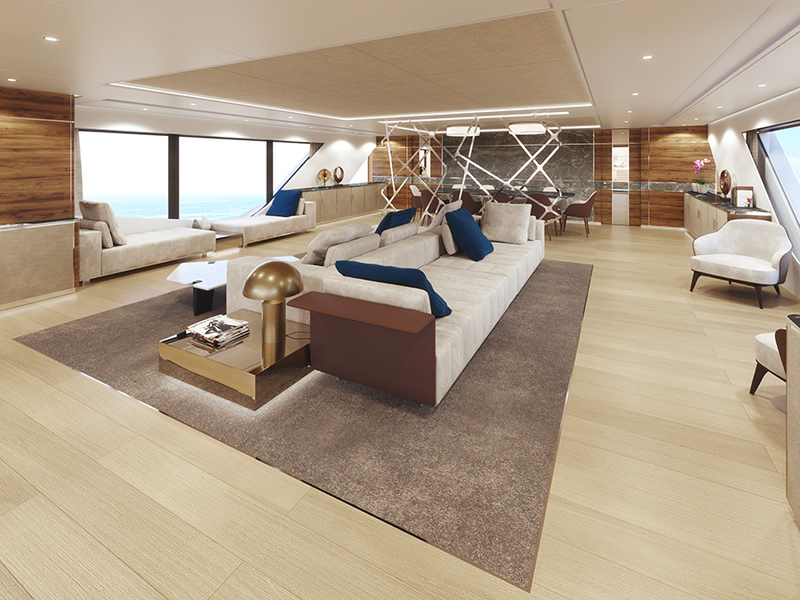 The 52-metre Supply Vessel has a central living area and an asymmetrical layout on the two sides, with a full-width chaise longue on the left and two small armchairs on the starboard side. 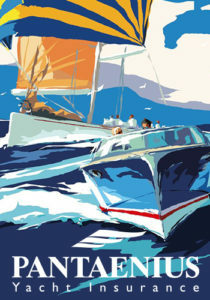 The natural light, which valorises this setting free from the excessive partitioning typical of yachts of this size, is guaranteed by the large, full-height windows on the hull. The lower deck has double en-suite cabins for the guests, with double bed or twin singles. The forward section of this deck contains the crew’s quarters, which are connected to the galley on the main deck by dedicated aisles. The crew can access the guests’ cabins through a service door in the laundry area, so they do not need to walk through the common areas. 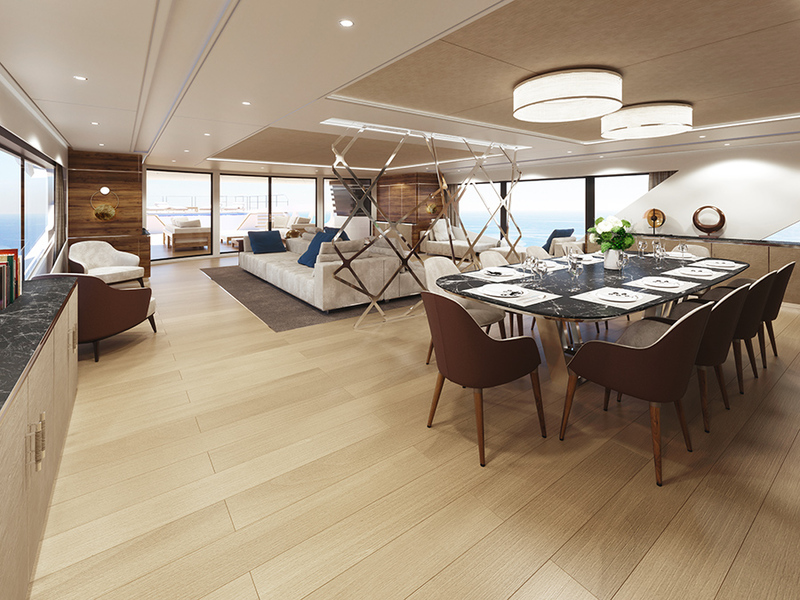 Lastly, on the sun deck, there is plenty of room to fit the dining area, which is connected to the galley through a food lift. An open-air cinema, with a folding screen, can be created in the forward section.